It Matters! Are You Prepared? Earthquake Information - It Matters! Are You Prepared? Please visit CERI for detailed information. The New Madrid fault system, or the New Madrid seismic zone, is a series of faults beneath the continental crust in a weak spot known as the Reelfoot Rift. Unlike faults in other places, the NMSZ faults cannot be seen on the surface. They are buried under roughly 3,000 feet of sediments called the Mississippi embayment. 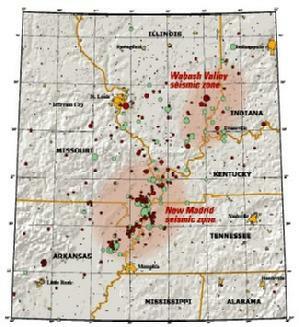 The fault system extends 150 miles southward from Cairo, Illinois through New Madrid and Caruthersville, Missouri, down through Blytheville, Arkansas to Marked Tree, Arkansas. It dips into Kentucky near Fulton and into Tennessee near Reelfoot Lake, and extends southeast to Dyersburg, Tennessee. It crosses five state lines, and crosses the Mississippi River in at least three places.